This unique venue, with it's glass and metal-filigree walls, is the centerpiece for events year-round. Exciting things are always happening in the backyard conservatory of Kim Brandstater, a jewelry maker and artist. The exquisite gardens on nearly an acre of land host special boutiques, artistic workshops and a biannual Lavender Marketplace for beautiful handicrafts, all things lavender and items with a French accent. No house is truly romantic without a backyard conservatory, say architects in England, where the earliest known conservatories were 17th-century compositions of stone used for storing food. 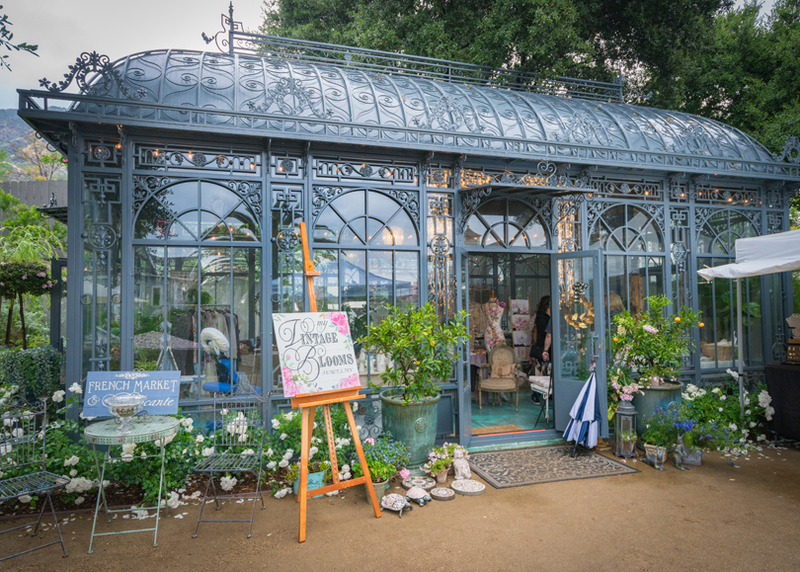 Then in the 19th-century metal structures were used as greenhouses for cultivating plants and resplendent venues for entertaining. 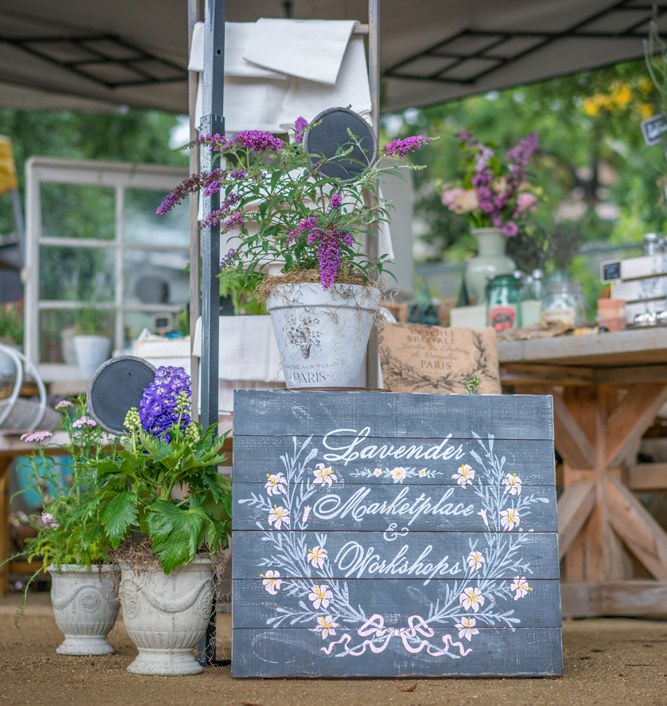 Lavender Marketplace: Wander through the gardens and find locally made soaps, jewelry, silk florals, pillows and gourmet food items. Open spring and holidays. This conservatory is used for a little bit of both. Kim Brandstater shares the structure with her husband, Justin, and their three children. It is made of coated steel with over 100 glass panels and located next to a Victorian farmhouse in Sierra Madre, California. One- and two-day workshops include painting florals with Christie Repasy, basic wire linking and jewelry making, and mastering pique assiette. Enjoy homemade lavender and white chocolate scones, fresh fare for lunch with ingredients from the potager, or a mother-daughter English tea. 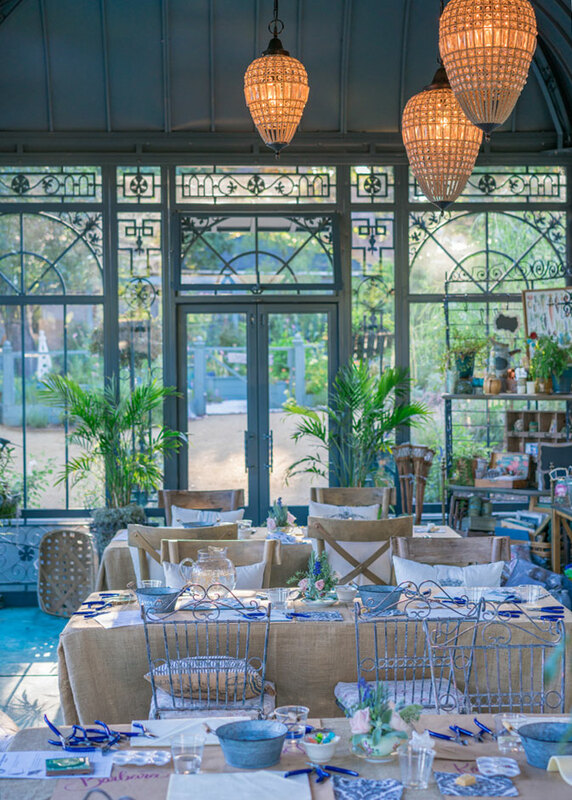 The couple’s love for nature and romance extends to the interior of the conservatory where a concrete floor stained with an acid wash settled into an aqua color resembling water. The main room is lined with birdcages housing finches, planters filled with palm plants and fiddle ferns surrounded by teak furniture. “I like the rustic look because it doesn’t detract from the garden; the garden is the view,” says Kim. The conservatory interior is illuminated by three crystal chandeliers. By day the room is streaming with light, but in the evening, dinner parties take on their own glimmering beauty. Guests dine under three chandeliers, a glass roof and a star-lit sky. Rectangular wooden tables are pushed together for intimate seating. 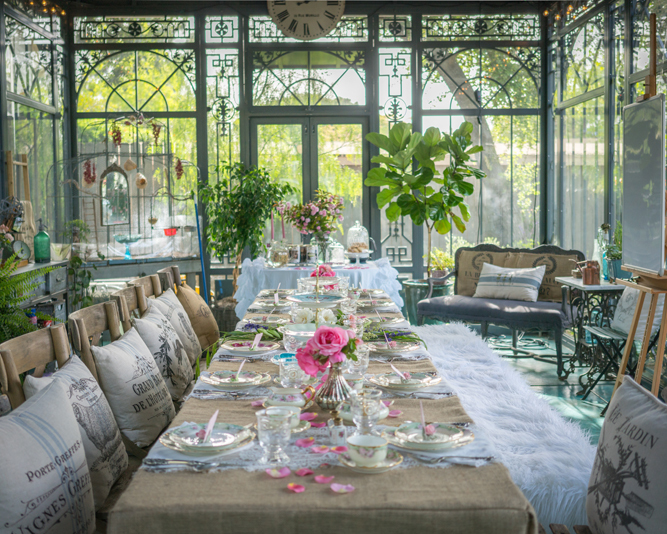 They are dressed with burlap, ruffle and lace table runners, while French pillows and faux-fur-covered benches add comfortable seating. Tableware and its placement are bearers of beauty and tradition on any table, so mix and match vintage with new silver pieces and china patterns, antique with country and “use what you have,” suggests Kim. Visit lavenderworkshops.com for information on upcoming events, workshops and markets.